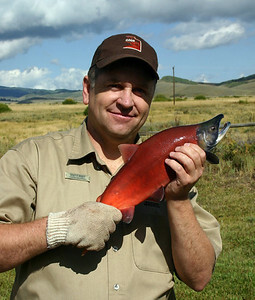 Utah Division of Wildlife Resources employee, Scott Root, holds a bright red kokanee salmon. 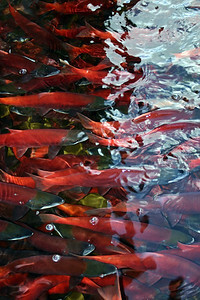 Kokanee salmon are usually silver-colored, but turn bright red during the annual spawning run. 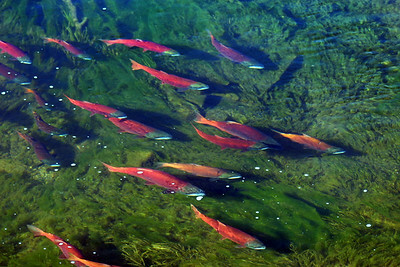 Kokanee salmon near Utah's Strawberry Reservoir. 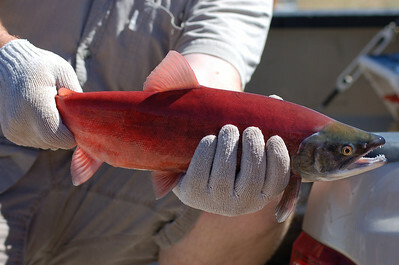 Normally silver-colored, kokanee turn bright red during their spawning run. 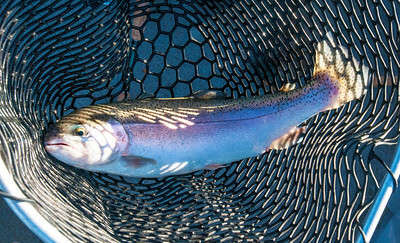 The Bonneville cutthroat trout, Oncorhynchus clarkii utah, is a race, or subspecies, of the cutthroat trout native to the Bonneville Basin of Utah, Wyoming, Idaho and Nevada. 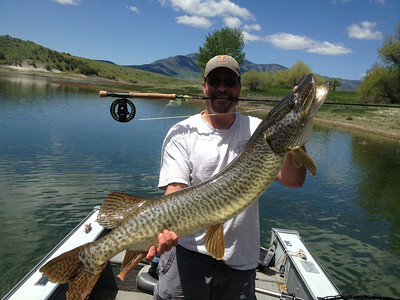 Paul Thompson caught and released this tiger muskie at Newton Reservoir using a fly rod. June, 2013. 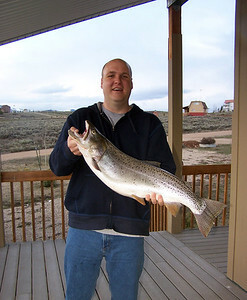 Ryan Houston shows the 30-inch cutthroat trout he caught at Strawberry Reservoir on May 14, 2010. Photo courtesy of the Ryan Houston family. 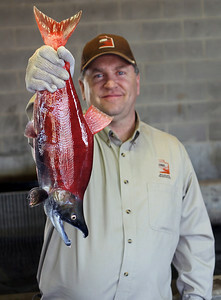 If you fish at Steinaker Reservoir this spring, you might catch one of these — an albino rainbow trout. Photo courtesy of Ron Stewart, Utah Division of Wildlife Resources, 4-20-2010. A female Kokanee salmon spawning at Strawberry Reservoir. Photo taken 9/2012 by Scott Root, Utah Division of Wildlife Resources. A Kokanee salmon spawning at Strawberry Reservoir. Photo taken 9/2012 by Scott Root, Utah Division of Wildlife Resources. 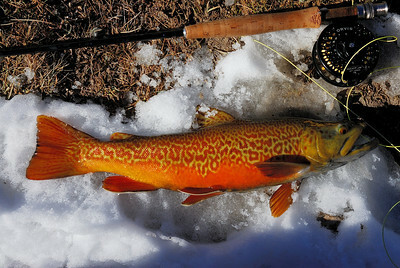 A tiger trout from Duck Fork Reservoir. Photo taken on 10-23-13 by Brent Stettler, Utah Division of Wildlife Resources. 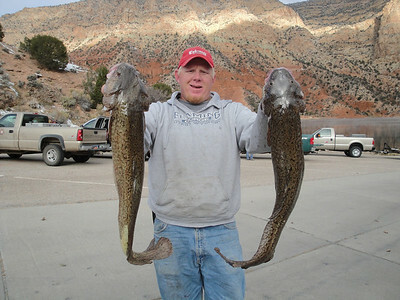 Ashley Bonser holds up a couple of burbot he caught at Flaming Gorge. 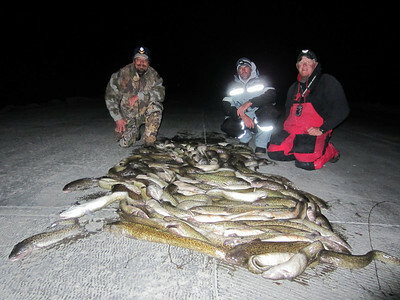 One night's burbot catch at Flaming Gorge. 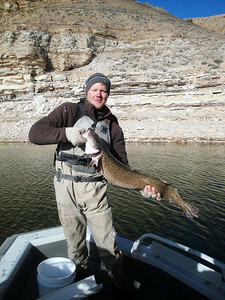 UDWR Native Aquatics Technician Ian Harding holds a burbot caught during annual netting at Flaming Gorge. 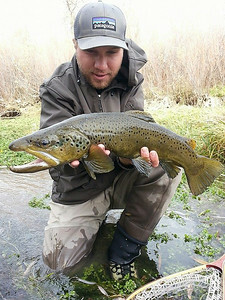 Seth caught this beautiful brown trout out of the Weber River. Photo taken 11-05-13 by Phil Douglass, Utah Division of Wildlife Resources. 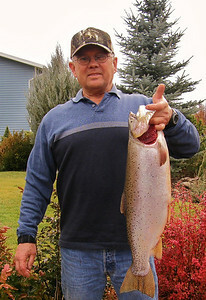 Ron Stewart fished this rainbow trout out of Steinaker Reservoir during some late-fall fishing. Photo by Ron Stewart, Utah Division of Wildlife Resources, on 11-09-13. Ed Knight caught this 24.5-inch cutthroat trout from Scofield Reservoir on Nov. 23, 2013. Photo by Brent Stettler. 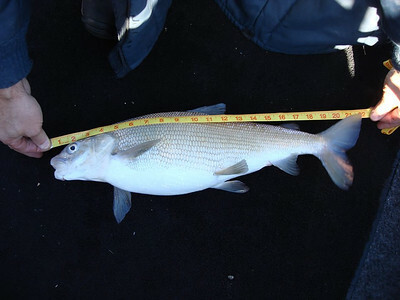 A 21.5-inch Bonneville whitefish caught during the spawn at Bear Lake. Photo courtesy of Kelly Mecham, 11-29-13. 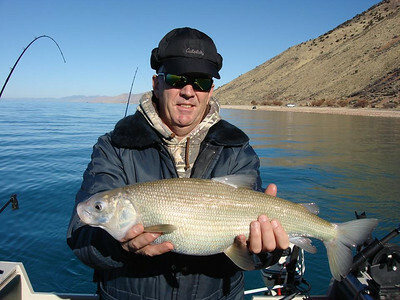 Kelly Mecham with a Bonneville whitefish he caught at Bear Lake on 11-29-13. 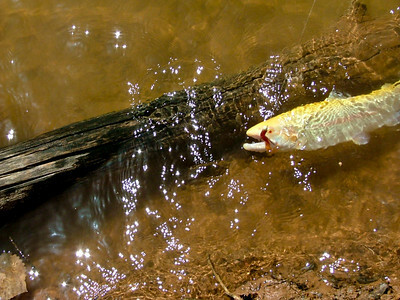 These native sport fish aren't found anywhere else in the world. 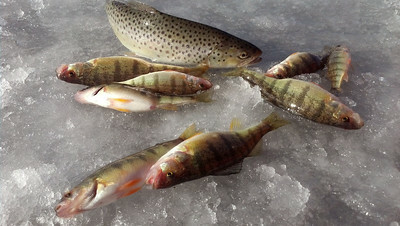 Winter is a great time to fish for yellow perch and brown trout in Utah. Photo by Scott Root, Utah Division of Wildlife Resources. 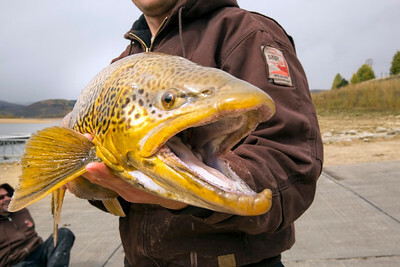 A close-up of a tiger trout caught during a gill netting survey at Scofield Reservoir. Photo taken 10-2013 by Michael Christensen. 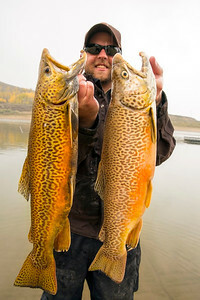 Aquatics professional Clavin Black with tiger trout out of Scofield. Photo taken 10-2013 by Michael Christensen. 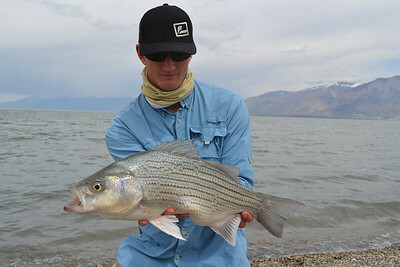 A 23-inch, 6.5-pound wiper caught at Willard Bay. Photo taken 4-12-14, Phil Tuttle, Utah Division of Wildlife Resources.